However, his love for music was still there, and he wanted to share his music taste with others outside of choreography. After hanging up his dancing shoes, Mike decided to invest in a controller to play with all the music he saved up throughout his years dancing. Something sparked in him, and it was as if Mike fell in love all over again. The freestyle aspect of DJing was refreshing, yet so familiar to him. With little guidance, Mike stuck with self-teaching, but he knew there had to be a better way to grow. Things fell into place, and Mike got accepted into season 4 of Academy of DJs, which he now considers his second home and family. With the supervision and guidance of his instructors, his passion for DJing continues to develop, and now he wants to be more than a bedroom DJ. Although Mike has freshly graduated from the academy and has been recruited as a teacher for the next season, he is still on a mission to grow and find his own style and sound. Aside from DJing, you can find Mike learning the anatomy and functions of the human body and applying that knowledge to his exercise regimen. Additionally, you can expect him to be all caught up with the latest DC Comics due to his love of the Justice League, more specifically Batman. Mike's DJ style began with smooth blending of future beats and Soulection-type music. As he continues to learn from his mentors at Academy of DJs, he incorporates more hip-hop style mixing such as scratching and other turntable techniques. 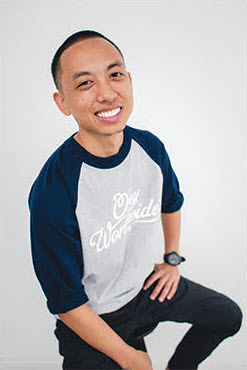 Mike feels that it has come full circle for him, because he is able to utilize hip-hop and R&B music he loves from his dancing days and combine it with his newly-found interest in future sounds.